This brings a whole new meaning to "amphibious vehicle." On Friday evening, NASA's Minotaur V rocket blasted off from its launchpad at a spaceport in Virginia, carrying the LADEE spacecraft on the first leg of its trip from Earth to the moon. The scene that resulted was beautiful. It was inspiring. It was epic. It was also not without its casualties. 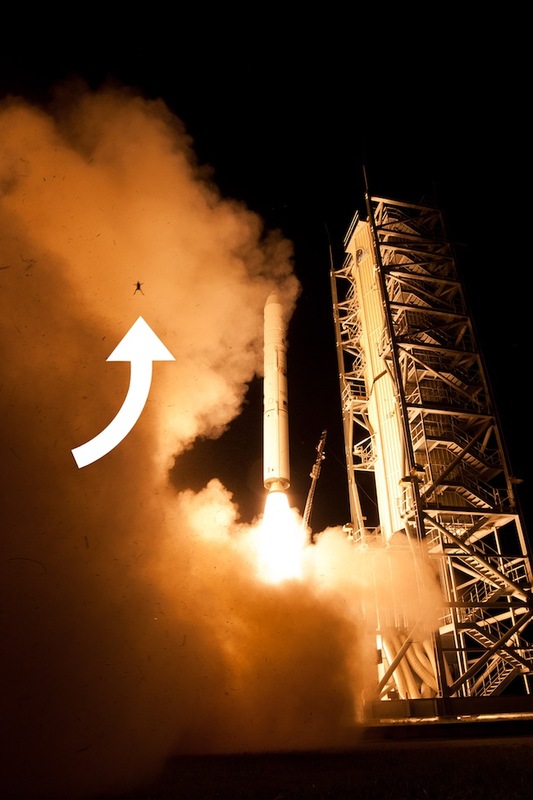 The picture above, snapped on Friday by one of the remote cameras NASA had set up for the big launch, captured a creature that found itself, alas, caught in the crossfire of humanity's drive to explore: a frog. A possibly very large, and certainly very surprised, frog. The launch setting, NASA's Wallops Flight Facility, is located on an island that is essentially a six-mile-long salt marsh; this little guy, it seems, happened to be in the wrong place at the wrongest possible time. Universe Today's Nancy Atkinson, who confirmed the veracity of the froggy photo, attributes the amphibian's Vitruvian Man-style pose to the animal's being startled by the sudden blast. I hope that was the case, as opposed to the alternate explanation: that the creature was simply shot away from Earth by the force of a human-created explosion. We can only speculate, though: We do not, alas, know the frog's fate. (Or, as Atkinson puts it, "We cannot say with any certainty that no frog was harmed in the making of this picture.") But rest assured, the animal's sacrifice, if it came to that, would not have been in vain: This was a frog that, we can safely assume, got closer to the moon than almost all others of its fellow creatures ever has. One small step for a frog; one giant leap for frogkind.